Our experience with the purchase of our new vehicle was very positive. We never felt pressured and were always kept informed at all times. Great experience! It was a great experience told them what I wanted and got just that will return when my wife needs her new car highly recommended this dealership thanks for the great experience ???????? "Stranded but not for long .... THANKS SO MUCH!!!" 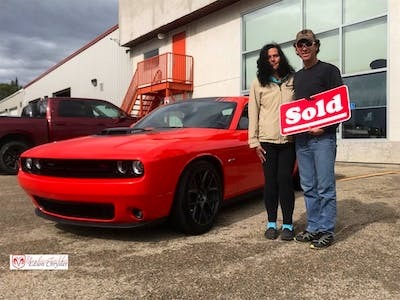 Thank you so much to Edson Chrysler for taking such good car of us. I was traveling thru Edson on a very warm day on my way back to BC with two dogs and an aging (non-Chrysler) SUV FULL of stuff when it just stopped running. 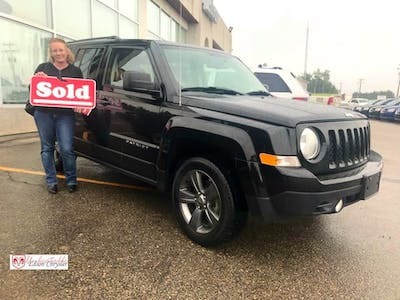 After a few calls, I reached out to Edson Chrysler and received a call back from Wendy, and within a short period of time, I had a tow truck and a ride to the dealership. When I received the news that the repairs would cost more than the vehicle was worth, I was helped out by Candy, who looked after me like I was family. 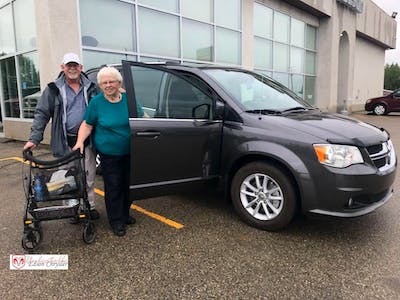 I can't say enough about how well I was treated by the entire staff at Edson Chrysler, but especially these two wonderful ladies, who went out of their way to make sure we (yes, I'm including my dogs in this) were taken care of in the transition to my new vehicle. It's a long drive back for service, but if I find myself in the area, even if not in need, I won't hesitate to go back!!!! Congratulations on your new Challenger! Thank you for taking the time to write about your experience. It is wonderful to hear that Wendy, Mino, Cody and Krissy were able to provide you with the excellent experience we strive to provide all our customers. We look forward to working with you again in the future. 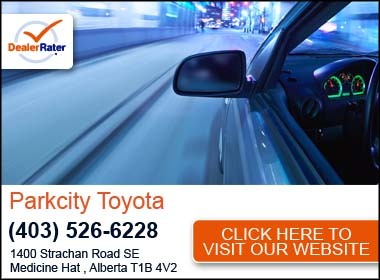 Your Friends here at Edson Chrysler! 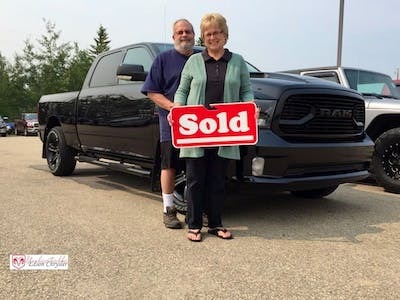 Edson Chrysler is an amazing dealership. The service is above all others. I will definatley recommend them to anyone looking to buy a new vehicle. Candy and Cody were great knowledgeable and no pressure sales. So much fun!! 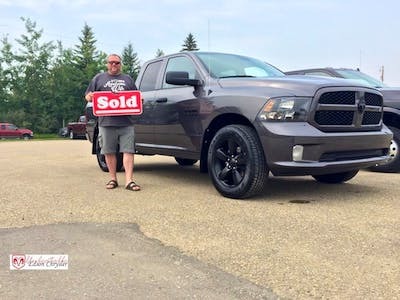 I would 100% shop with Edson Chrysler again , Thanks for the sweet ride!! Was on my way back to BC when I had an service message pop up on my dash. I decided to stop in Edson and get it looked at. The service people and everyone at the dealership that I chatted with was friendly and professional. I had the truck repaired and was back on the road quickly. 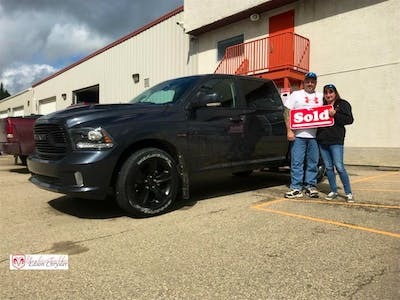 Thank you everyone at Edson Chrysler for taking such good care of us! 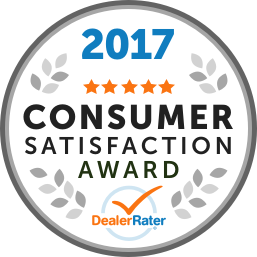 From the trade-ins to choosing options and getting the vehicle for us we truly appreciate it! "Lacking service from multiple departments and lies"
I recently bought a vehicle from the dealership, paid for the vehicle and then when I got the keys I only got one...... As a dealer I expected all of them to have two keys, that is unfortunately not the case nor was it mentioned. I also had to come back several times in the first week to have warranty work. Then the vehicle wasn't registered from out of province as they had stated. When I said that they had to register it as this was part of not only the inspection aspect (which several parts were not up to par) but that it is why I had bought the truck. They then made it seem like they were doing me a favour. Having worked in the automotive industry I wanted to chat with the manager and tell her why I was upset and how this was not what I had hoped for in my experience, which in turn she basically came at me being accusative, saying the deal she gave me (which was the exact same as the list price - found out when they negotiated with me they just gave the same and added a dealer fee - which I later found out is something that they can't add to a dealer listed price.....so essentially the same price but make it seem like they are working with you.) was more then enough to make up for anything else. The only reason I had bought at the dealership was for an enhanced service experience, well that is not the case there/ I never was mad or upset with the sales or direct service staff, but it was the sales and general manager that were very uncooperative to deal with. Three days after I bought the truck, the dealer had some sales team in that were mass buying vehicles the dealer had sold. This was an effort to sell new vehicles, they also lied in their sales pitch, got them in multiple loopholes and was going to charge you way way way more for the vehicles and give you way way way less then they were originally offering. Very very very pushy sales people. The service and sales staff are nice, just misinformed and it seems like it is from the top down. The service manager has been reasonable when I had a warranty job, also found out that your "Gold" warranty doesn't cover things that seem reasonable, they then wanted to charge me for diagnosing when I had told them what the issue was, plus I figured it wasn't warranty from another dealership and had phoned them as I had not even had enough for an oil change yet. Well needless to say, I will be taking my business elsewhere, also for anyone's information the fine print of the Pro Seal package is pretty non helpful..... I would not recommend. I have sat on whether to post this review for a while, and after my 5th not great experience in a row at the dealer, I have decided it was worthy to post as I had given them the benefit of the doubt more often than not. Will not recommend to anyone.